Looking to sell tickets quick? Register now. Airlines take heed: The Terminal might be the perfect movie to show travelers whose flights are delayed. Not only will stranded fliers find this comedy diverting enough to forget their own travails, but they may feel inordinately grateful to be able to walk out the airport's doors once they reach their destination. 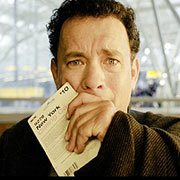 Man without country: Tom Hanks as Viktor Navorski, who is trapped at JFK. Such was not the case for the unfortunate Viktor Navorski. He leaves his fictional, tiny Eastern European homeland of Krakozhia to visit New York City, but because of a coup and U.S. red tape, he finds himself trapped in the international terminal of JFK. At least it's JFK, where there are plenty of diversions, of which the resourceful Viktor ultimately partakes. Viktor is convincingly played by charismatic Tom Hanks, who even pulls off a Slavic accent. Navorski, with open-hearted warmth and innate integrity, could be Forrest Gump's brighter, Balkan cousin. The story is loosely based on a true story of an Iranian man trapped in Charles de Gaulle airport in Paris. Hanks and director Steven Spielberg bring charm to a story that is part fish-out-of-water fable, part romantic comedy and part heartwarming drama. Despite the film's considerable charm, elements of the plot don't always work. The least believable aspect is the romance between Viktor and Amelia, the beautiful but unlucky-in-love flight attendant played by Catherine Zeta-Jones. Zeta-Jones does little to invest her character with depth or likability. For a simple soul such as Viktor to hook up with a smooth operator such as Amelia, who is smitten with a married man but also seems to have a man in every port, strains credulity. Many of the other supporting performances are worth noting. Stanley Tucci's officious twit of an airport manager has some funny scenes with Hanks and airport staff. And there's a quirky, scene-stealing role by Kumar Pallana (The Royal Tenenbaums). Another small sticking point: Initially, Viktor's ability to understand English is minimal. But depending on the level of comedy needed for the scene, he grows more or less fluent. One day he can't understand the idea that his country has experienced a revolution; the next he's urging Amelia to get a pair of "sensible shoes." But if moviegoers suspend their disbelief — easy enough thanks to the diverse and talented cast, as well as Spielberg's capable direction — they're bound to enjoy this cinematic fantasy. © Copyright 2004 USA TODAY, a division of Gannett Co. Inc.